Very early in the morning, the chief priests, with the elders, the teachers of the law had reached a decision. But they had run out of coffee beans and so they waited for someone to make a quick run to Starbucks before making any public statements. A certain man from Cyrene, Simon, the father of two boys, was passing by on his way in from the country, and they dragged him out of his car and forced him to carry Jesus’ cross. Next they dragged Jesus to The Place of the Skull. And the police search helicopters were circling overhead. The people stood watching, and the politicians and business leaders even sneered at him. They said, ‘He saved others; let him save himself if he indeed the Chosen One.’ The soldiers (with M-16s over their shoulders) also came up and mocked him. They offered him blackmarket painkillers and said, "If you are the king of the Jews, save yourself." Meanwhile a lady’s iPhone kept going off. The ring tone was catchy Katie Perry tune from about two years ago, the one where she was riding on a long swing. One guy next to Jesus yelled, "Aren't you the Christ? Save yourself and us!" Another yelled back at him, "Don't you fear God?" Jesus interrupted the argument, saying "I tell you the truth, today you will be with me in paradise." And as I pulled out of the driveway our neighbors’ ragged belongings were thrown out on the lawn, the marshal was just doing his job because the bank was foreclosing on their slumlord even though the he was still taking rent from them and sitting at home, no where to be seen. Jesus yelled, "Dear woman, here is your son," and to the disciple, "Here is your mother." And from that time on, John took Mary into his house, as if she were his own mom. It was now about noon, and darkness came over the whole land until three-ish, for the sun stopped shining. And then the special curtain was torn in two. When I plugged my portable hard drive into the Pro Tools last night there was this pop and smoke came out of it; my friend and I looked at each other, both afraid of the worst. Then Jesus called out with a loud voice, "Father, into your hands I commit my spirit." When he had said this, he breathed his last. I remember sitting with my wife's grandpa in his last days while he was gasping for air. A tube blocked up his laboring throat so that he couldn’t talk. But his eyes, they spoke volumes. I want you to be free to know, one day at a time, your life as it shall become. Trust your eyes and the scent of things and give your feet over to that lit-path alone, one step at a time. not my advise, another’s advise or anything else born from outside your discovery. Instead, eat what bread falls around us all. ‘Just enough to last from breakfast and to stretch into a dinner with unexpected guests when necessary. When we pulled away from the house this afternoon there were vultures circling overhead. Ready to take what was to become theirs. But the life is gone from that. The ocean’s hand is long. Or is it wide? Or is it her entire reach? I’m holding his hand and so much more this year. And there’s that vast ocean again handing to me and taking back and handing yet again. This weekend I am hosting up marriage covenants between two friends of Kelley and mine. Its at a vineyard in Dahlonega, GA. It should be a blast. So, Kelley and I have been married ten years as of June. And each time I do a wedding it is a chance to remember how much it meant for our friends to participate (grooms men, bride's maids, Ty Saltzgiver- my Young Life trainer who married us, Ryan Long- the singer-songwriters who played for nothing but a hotel room). The premarital counseling, service design, and the prep for whatever homily I offer- they all give me a chance to revisit the compelling thoughts of love shared by everyone in God's World. We'll see it all then, see it all as clearly as God sees us, knowing God directly just as God knows us! But for right now, until that completeness, we have three things to do to lead us toward that consummation: Trust steadily in God, hope unswervingly, love extravagantly. Ten years ago I didn't know half of what I know about love now. Because love requires locating ourselves in the unknown. It requires mystery and unfinished-ness. People are naturally relational- we understand ourselves in relationship to others and our contexts, and have a consciousness about that relationship. Love requires us to leave that consciousness open for edits. We leave ourselves vulnerable, accessible. Love edits our memories (forgiveness) and our dreams for the future (hope). Love of God, and our beloved-ness as children of God... does a similar thing. True knowledge of God-is-love-ness requires receptiveness, and it "softens" us. True participation in this Love-of-God-ness casts out fear (memories) and makes all things new (future). So asking having strong enough 'faith' to be featured on CBN, or being the greatest political orator of our time, or making poverty history... without love is nothing, gets us no further along, and starts to sound like a creaky gate or a bent cymbal. In a very short review: the album needs to be played loud. Its one you need to listen to more than twice and then it will haunt you. At first, Plant sounded less Zeppeliny than i expected but after a while you recognize the violins of Krauss, her haunting shrills and Plant's mood building swells as part of the old Zepplin greatness. And Krauss' willingness ot bring her whole self into rock-feeling songs like Let Your Love Be Your Lesson, is unmistakably what makes the album work. Two unlikely paired together to remind us why we love them both and to host an entirely different project. But the real flair is Burnett's ability to pull the best repertories for these two. What I done to me, I done to you, What happened to the trampled rose?" from trampled Rose by iconoclastic jazz great, Tom Waits. Waits can make anything haunting, but who would have guessed that sweat Alison's voice could be mixed to match Wait's bowed saw and rake. from Sister Rosetta Goes Before Us by California female songwriter Sam Phillips (also known in old CCM circles as Leslie Phillips). if you have not heard it yet you need to! And if you don't know these two great songwriters, stay tuned I'll post more of their stuff. Four strangers sat on our couch. They were joined by six other neighbors whom I already knew. "Five to thirty is the federal minimum and maximum sentence," we heard as we all sat in my living room last night to listen to Stank's attorney tell us what he was looking at, time wise, and what how we could help. It was Monday night, Eve had just started her second week of Kindergarten and wanted to show everyone her homework. It was clearly a pause in each of our days. Minister to us in our cowardice and timidity. Set us to be as bold as you are true, to meet the authorities who resist and arrest . . . our ancient mothers, our old convictions, powerful ordaining communities and last, even, city hall. Stank is in his early fifties, and except for his balding head and pachy beard you'd think he was late twenties. Dark black, chiseled muscular physique, and tattooed by the sun that follows him every day as he works odd jobs for cash. And a contagious grin- always smelling like the cheap Black-and-Mild cigar that he is almost always smoking. He helped me build my deck, effortlessly lifting by him himself the 14 foot long 2 X 8 that I needed help lifting. Stank has lived with his mom and nephews in this neighborhood for over 30 years. He is annoying, at times, with his inconvenient knocks on the door looking for a quick job or errand he could run for a few bucks. And then impossible to find when you do need help. But he’s also the very guy you want watching your house. The guy who can give you the scoop on trouble in the neighborhood. ‘Turns out he got close enough to the trouble a little while back that he is facing 5-30 years. Drugs and drug related burglaries and assaults are a problem in our neighborhood. And so the Georgia Bureau of Investigation (GBI) and the Atlanta Police Department (APD) and the District Attorney’s Office got together to build a plan. GBI and APD investigators would set up a series of drug purchases and deals, record them on tape, and build up cases on the dealers and users in our neighborhood. This covert operation would help them get to the real kingpins bringing the drugs in, catch the kids before they are caught in cycles of using, and clean up the streets of those habitual users who are nearly always the thieves and perpetrators of domestic abuse and assault. One officer told me that the whole thing is like a season of The Wire. The cases were built for as long as four months and then near memorial day they were all brought to a grand jury and bench warrants were issued for over 100 of our neighbors. The APD set up a road block a few weekends around memorial day and they would grab the suspects, over 70 of them we know for sure. This detective work and police enforcement was met by a second judicial process designed by the DA’s office called Project Turnaround. The DA’s office appointed a community prosecutor to each of the police zones involved and that prosecutor gave the men (its all ‘men’ that we know of) under 25 an option of a year long rehab program and expungement of their record. And those who did not choose this deal or any born before 1983 would be recomend for the maximum sentence and banishment for the neighborhood. Banishment, totally medieval, huh? It has been used in limitted courses in Georgia, and though it simply shuffles our problems on to another place and another neighborhood’s problems over to ours, it does have some benefits in the case of repeat offenders like house robers and drug dealers. But the community prosecutor is asking for banishment with every defendant over 25, including Stank. And then add to all that what the court system in Fulton County has set up called the “non-complex” system. With all non-violent arrests the defendant is scheduled to go through hearning, arraignments, pleas, or go to trial in under 9 weeks from the arrest. Well this system has gotten bottle necked with the influx of the pick ups done by APD and GBI. This bottle-neck has also been worsened by the decision to eliminate 16 attorney positions in the PD’s office. So Stank and those picked up with him do not stand a chance, if they are over 25. Stank got in trouble when he was supposedly doing work for a neighbor a few streets down (the 10 of us in my house were among Stank’s many landscaping/odd jobs clients). This client of his allegedly asked Stank if he knew where to get him $30 of cocaine. As the story goes, Stank obliged, took the man’s money, and returned with $30 of cocaine. They supposedly have it all on tape and are charging him with possession and selling cocaine. Now depending on the tapes and other court details this may be exposed as some sort of entrapment, but the short of it is that Stank may have a chance becasue we found him a good defense attourney. Because of the readings of Wendell Berry that I have been doing I was reminded of the importaince of such intentionallity. Many in our neighborhood might not have know about this. You might not have know about this. And instead of learning about the unfair systems we would receive them blindly. The resurrection of the crucified lamb reversed this. It placed the authorities in check. This kind of neighborliness requires the risk and hope and forgiveness and imagination of communities. These kind of practices keep your head from opening into a future-less passive window. As soon as the generals and the politicos can predict the motions of your mind, lose it. Leave it as a sign to mark the false trail, the way you didn’t go. Be like the fox who makes more tracks than necessary, some in the wrong direction. Practice resurrection. Aperture and Wendell Berry's "Sonata at Payne Hollow"
without limit. It’s as if a poet finally were free to say only the simplest things. What has come into being in [the Word] was life, and the life was the light of all people. The light shines in the darkness, and the darkness did not overcome it. To choose a pretend “captured” portrayal of God, as a snap shot, with 400 speed film and quick shutter speed, and small aperture is to avoid the exposure to the scorching-brilliant glory of God. ‘To be like the children of Israel sending someone else up to Sinai. To cover our eyes, to resist light is to attempt mastery of it, to contain it, to domesticate it. To choose a pretend “still life” portrayal of God’s creativity is to make life what it is not. Such a choice explains away life’s rhythm: death and resurrection caught up in the baptism of the Holy Spirit, awaiting the revelation of the Children of God. 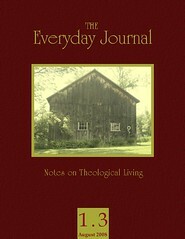 To theologize is, as Wendell Berry describes painting, to “show it as less than it is.” In this case we can learn that both the personal nature of God and the created nature of God’s work is like the Word of God, it is dynamic or “living and active,” as the writer of Hebrews has sketched. sweeping elderminds like dreamseeds of evervision. lending lift, everloft, and standard. who sings that song to which our ears belong. December’s light is late as usual. hotter than any coal placed on my lips. Nothing ontological changed. I still perspire and regret and fear and hate to shave. I’ve been reverend according to the traditional language of the church reforming for almost 20 hours now and I think the same thoughts and like the same things. But yesterday during my ordination service some things new were planted and some old soil was given rest. I’m sitting in a warehouse loft with large pieces of fine art and pop found art on the walls. My friend Fred has spent several years on a painting he entitles the Call of St. Mathew, it sits on the floor here in the lofts where I've managed a coffee shop. Soon it will be brought back to him, I'm still not buying art like I hope to be one day. Soon, the other art work will be picked up my the friends who donated it for the extended Eucharist that we celebrated here, turn tables, wine, cigars, bread left over from the worship gathering... all picked up, nothing really changed about this warehouse or the building we met in for prayer and charges. I was blessed yesterday, by old and new friends, playful mentors, and deep galvanic tradition. But that blessing is all around us. In the beauty of the party, in the green of the summer fescue, in the pavers of the sidewalk and the lead paint of the old warehouse. Blessing is waiting, everything is being anointed. What is changed in the ordaining is our eyes, our ears, our imagination. It gives me hope to believe that Mary did not always want to be pregnant. Not at first. Not really. too sharp and raw and private to ever be told. The title of my journal was crops rotating, and i never finished it. But, I think this is the waiting. As i think about it, now, six months later, I realize that our crops are being rotated as we name, as the dictionary changes, as we are "inexplicably bathed in irrational incomprehensable delight."